Imaging company utilizes Shipping Solutions to upgrade their export department. FLIR Systems utilizes Shipping Solutions Professional to automate AES filings and restricted party screenings. FLIR Systems is a world leader in the design, manufacturing and marketing of thermal imaging and stabilized camera systems for a wide variety of thermography and imaging applications. They purchased Shipping Solutions in order to standardize their export forms and keep an electronic file of their shipping documents. Getting started with Shipping Solutions was easy. “It’s plug and play,” says Robert Scott, Traffic Supervisor at FLIR Systems. 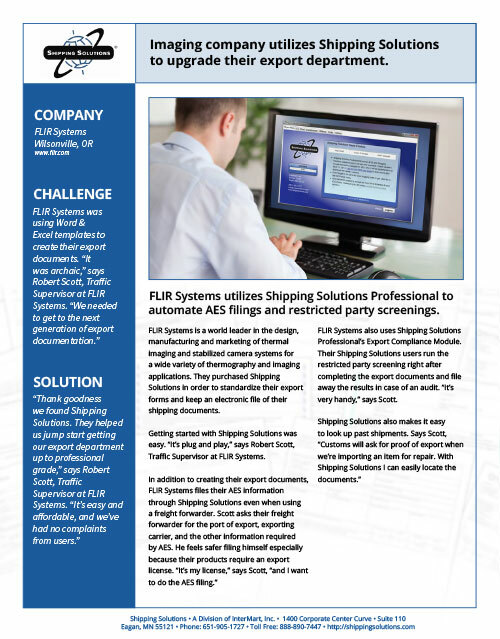 FLIR Systems also uses Shipping Solutions Professional’s Export Compliance Module. Their Shipping Solutions users run the restricted party screening right after completing the export documents and file away the results in case of an audit. “It’s very handy,” says Scott. Try Shipping Solutions free with no obligation and see why it’s the #1 Selling Export Document Software. "We use Shipping Solutions by InterMart. Using this software greatly reduced the amount of time it took us to generate Word or Excel based documents. It also provides for consistency of information between the documents —no more incidental typos!" "This is such a great tool! I love the Windows look and the ease with which it works. I feel very confident recommending Shipping Solutions to all my customers who export." "Thank you so much for developing an export software program that is actually user friendly! I am so thrilled to have this new tool at my fingertips. I just installed it this morning and cannot believe how easy it is to use." A Division of InterMart, Inc.
© 2019, InterMart, Inc. All Rights Reserved.